Beer and New Year’s Eve might be inseparable in Australian culture but it’s not often you see the same connection with Chinese New Year. 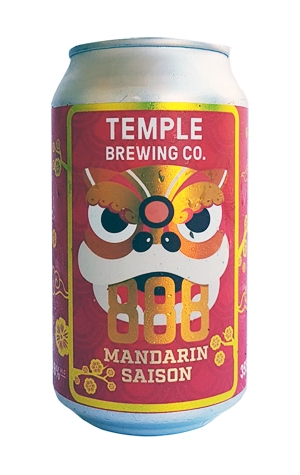 For 2019, however, Temple Brewing has looked to capture that celebration in a can in the form of 888, a mandarin saison or “lucky ale”. Every aspect of the beer’s design is inspired by different traditions around Chinese New Year: eight is considered the luckiest number and red is the luckiest of colours, so the red tinnies of 888 should be about as lucky as it gets. The lion on the front represents the lion dance performed in front of businesses to usher in a lucky year of trade and mandarins are traditionally brought to the houses of friends and family at this time of year. Other than mandarin juice, the beer also includes orange peel and is dry-hopped with Germany’s Mandarina Bavaria, a hop known for the mandarin and tangerine flavours it imparts. Just as all good saisons should be, the beer is very much driven by the yeast whose spicy and fruity notes combine with a light zest from the orange peel and the citrus juice. While the addition of juice can easily add some sweetness to beers, that's not the case here, instead contributing to a dry finish. Hopefully, it might contribute some good fortune in the year to come too. You can read more about 888 by reading our article about the beer here.